UPDATE: "The best explanation of the U.S. government shutdown points to two factors. The first involves information, or what people think they know. The second involves incentives, or what motivates our elected representatives. From decades of empirical research, we know that when like-minded people speak with one another, they tend to become more extreme, more confident and more unified -- the phenomenon known as group polarization. One reason involves the spread of information within echo chambers. . .
With respect to incentives, elected officials are often motivated by one goal above all: to get re-elected. They are focused on their own electoral prospects, not those of their party. They know they have to answer to their constituents, not to the nation as a whole. Within the Republican Party, many members of Congress have no reason to fear a challenge from the left. There is no chance that they will lose their seat to a Democrat, and a moderate Republican isn’t going to run against them. The only threat is from the right. With respect to a controversy that the public is closely following, the main question may well be whether, in the view of the most extreme conservative voters, the legislators will 'cave' to President Barack Obama or instead stand up for their convictions. Is it any wonder that many Republican members are willing to run the risks of a shutdown? . .
Read Bloomberg, Shutdown Psychology Made Simple, which notes there will no compromise by "the most extreme members of the Republican Party [unless they] are able to move out of their echo chambers, and unless the incentives of those members are significantly altered." Why is the U.S. so politically polarized? "There are two explanations . . . The first is that if you know a lot about politics, you are more likely to be emotionally invested in what you believe. Efforts to undermine or dislodge those beliefs might well upset you and therefore backfire. The second explanation is that if you have a lot of political knowledge, you are more likely to think you know what is really true, and it will be pretty hard for people to convince you otherwise. The general lesson is both straightforward and disturbing. People who know a lot, and who trust a particular messenger, might well be impervious to factual corrections, even if what they believe turns out to be false." Read Bloomberg, Why Well-Informed People Are Also Close-Minded. As I noted before, The Great Lecherer, aka Newtenstein, said: "Lincoln once said if a man won't agree that two plus two equals four then you'll never win the argument because facts don't matter . . ."
UPDATE VI: "[F]ew [Republicans] are willing to stand up to the zealots, and even fewer are willing to cast votes that depart from the pack. All of them dutifully recite the mantra that Obamacare is an abomination that ought to be eliminated, and none notes that it is basically the same plan as 1994’s Grassleycare/Hatchcare/Durenbergercare/Chafeecare, which was built around an individual mandate, private insurers on exchanges, and premium support for less fortunate Americans. More strikingly, no one notes that Ryan’s long-term plan for Medicare, built around regulated exchanges and premium support, is basically Obamacare for seniors. Every opportunity to reform and refine the Affordable Care Act through traditional institutional means, working with both parties, has been rejected by them." Read The Atlantic, The Republican Hardliners Aren't Conservatives, They're Radicals. 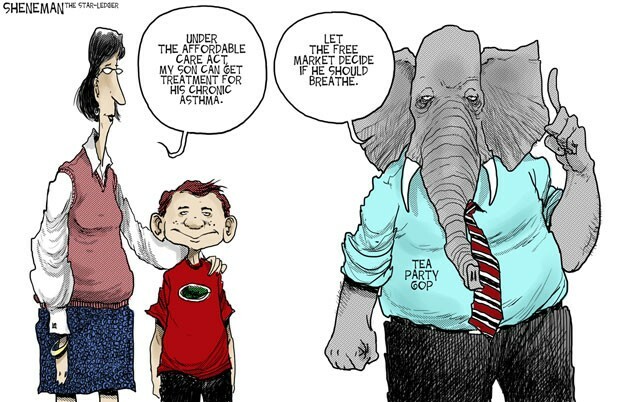 UPDATE V: "Americans hate Obamacare but love the Affordable Care Act. That is the big story from one of America’s more reliable sources of information, Jimmy Kimmel. . .
One woman who vehemently condemned Obamacare while singing the praises of the Affordable Care Act was asked by Kimmel's merry pranksters if she thought an informed electorate is vital to a healthy democracy. The woman answered with a firm 'yes' -- making herself look like an idiot, not only to the television audience, but to the much bigger audience who have watched the clip online. " Read the Los Angeles Times, Obamacare-hating voters have been suckered by right-wing spin. UPDATE IV: "Republicans have pulled out all the stops to kill Obamacare, the president's landmark health care law that requires every American to purchase health insurance by 2014. There have been lawsuits; there have been bills (40 in the House so far); there has been a Supreme Court case—all aimed at rolling back a law that that the GOP says is an assault on individual liberty. Now, with only a few more months to go until the individual mandate—the requirement that we all have coverage—kicks in, Republicans are frantic; some are even threatening to force the United States to default on its debts if Democrats don't agree to delay the law. This is odd because the individual mandate, the cornerstone of Obamacare, was originally a conservative idea. It was first proposed by the Heritage Foundation in 1989. And scores of Republicans—not just Mitt Romney—have backed the idea in the past couple of decades. Here are some of the GOPers who supported Obamacare before Obama." 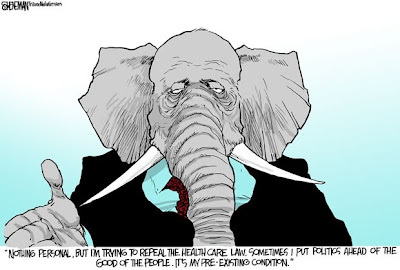 Read Mother Jones, 25 Republicans Who Supported Obamacare Before Obama. UPDATE III: "Obamacare isn’t perfect, the former political spear-carrier said. 'But to even improve it, to make something work, you’ve got to participate in the process. [Republicans] are not even participating in the process.'" So says a former Republican after bout with testicular cancer and four rounds of chemo, who is now "dismayed by his party’s cavalier attitude toward the health care debate." Read The Atlanta Journal-Constitution, A Republican conversion to Obamacare. UPDATE II: For another "beautiful example of a writer so intent on criticizing Obamacare that she’s missed the fact that the law is doing precisely the thing she wants done. . . hoping for a replacement that looks like, well, Obamacare", read the Washington Post, Peggy Noonan attacks Obamacare for doing what Peggy Noonan wants Obamacare to do. UPDATE: Republi-cons want to repeal Obamacare, they have tried 40 times already, but "have no idea what is it is they’ll do — save for undoing what the Democrats did. But for all Gingrich’s bluster on the subject, the simplest way to understand that policy vacuum is to understand Gingrich’s pre-Obamacare health-care plan: It was Obamacare. So that’s an individual mandate plus tax subsidies to purchase insurance. That’s the core of Obamacare. And it’s no surprise Gingrich supported it. Lots of Republicans did. Gov. Mitt Romney even signed a plan like that into law in Massachusetts. . .
'We are caught up right now in a culture — and you see it every single day — where as long as we are negative and as long as we are vicious and as long as we can tear down our opponent, we don’t have to learn anything,' Gingrich said at the RNC.'" Read the Washington Post, Newt Gingrich explains how the GOP’s Obamacare tactics backfired.